Regional International is the official magazine of ERA (European Regions Airline Association). Published bi-monthly, it is the authoritative source of information on legislative, regulatory and industry news for any company operating in the European aviation sector. 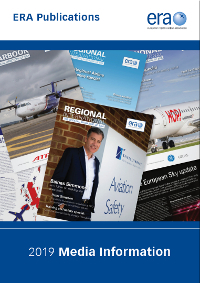 Regional International ensures that its readers are up-to-date with the ever-changing European aviation landscape and it provides authoritative reporting and coverage of the latest legislative and regulatory developments. Each issue of this trusted source for industry information includes comment from ERA's Director General, interviews with industry experts and in-depth editorial coverage of current market issues. Copies are distributed to ERA members and the digital version is available online allowing readers to access across all media platforms.